IMTS already starts next week in Chicago! The International Manufacturing Technology Show will bring 114,000 people from the industry together to get ideas and find answers to their manufacturing problems. Are you attending? Robotiq will be there (@Samuel_Bouchard, @Tyler_Berryman and @Olivier_Grenier ) so come and find us at Universal Robots booth (North Building, Stand N-6865) where we will demo our 2-Finger Gripper, Force Torque Sensor and Camera on a UR3. We'll keep you updated about our experience at the show by sharing demos, new products and applications that caught our attention. We invite you to share your thoughts and findings in this discussion! We will be there, come see us at booth W-305. We will have a robot operating in the Biax Booth. We will have a Robotiq 2F85 as well as FT150 on the demo. First day at IMTS already over! 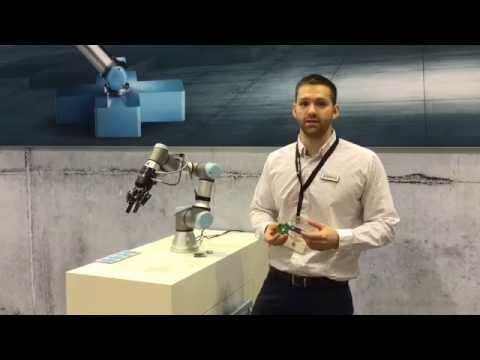 We will continue demoing our products at Universal Robots' booth all week thanks to the UR+ developer program. Take a look at @Tyler_Berryman presenting our demo, which is a pick and place with insertion in jig. Come check it out in North Building booth N-6865 and stay tuned for other IMTS updates! Great demo by @Samuel_Bouchard and @Tyler_Berryman this morning at UR's booth, presenting our products' plug and play integration with Universal Robots. Stumbled upon a 2-Finger Gripper mounted on a UR3 at Ambrell's booth. They are demoing an induction heating application utilizing pyrometer and thermal imaging. 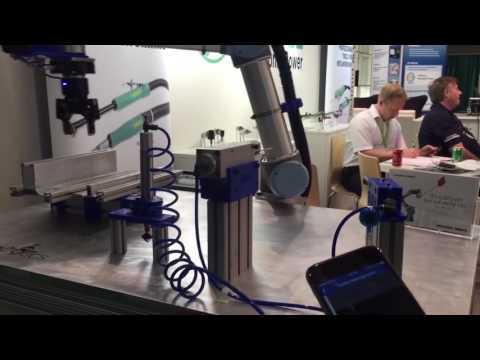 The work cell demonstrates a method to maximize manufacturing throughput using cobot-assisted automation. We met @matthewd92 and @RobGoldiez at their booth today in the West Building to show us how their mobile app allows to gather real-time data from the UR robot and receives push notifications of specific events. Thanks for the demo guys! 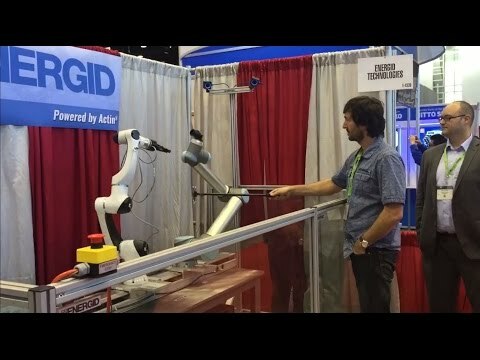 Dhiral Chheda, senior robotic systems engineer at Energid, gave us more details about their real-time dynamic collision avoidance demo at IMTS (Robotiq 2-Finger Gripper is featured along with the UR10 and a new industrial robot soon to be released). They use the Actin robotics simulation and control software that can simulate the motion of any kind of robotic arm or kinematic change. Here's the demo below! 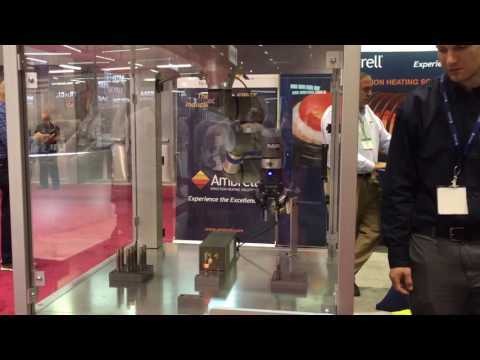 You can click here to review the latest manufacturing technologies we saw at IMTS. The prize for most spectacular big machine of the day has got to go to this DMC 60 H Milling Machine from Okuma. Check out this tool-changer! It's like the automation version of Edward Scissorhands. 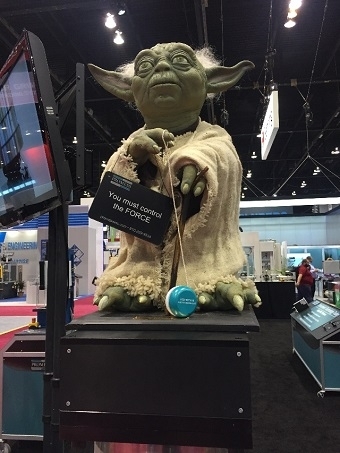 We saw a lot of exciting manufacturing tech in Chicago last week. In this final blog post, we consider the top three takeaways from the show. Thanks to everyone who allowed us to film their demo and feel free to share you own IMTS highlight below!